Today there were three of us - Anna, Hylton, and myself. 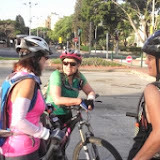 Anna led us on what turned out to be another special city ride, whose route was Ra'anana -> Herzlia -> Ramat Hasharon -> Machane Glilot -> Herzlia -> Ra'anana. We made our way through parks and along cycle lanes, over bridges and across decks, finally stopping for refreshments at the lovely Tapuz coffee shop in Herzlia. It was a gentle and scenic 24 kilometers in cool morning air, but as none of us brought a camera you're just going to have to take our word for it! I was concerned that nobody would turn up this morning, considering the security situation and the fact that the Cyclenix upper management is overseas for two weeks. But in the end there were seven of us (once Uri had popped home and back to get his bag). Uzi volunteered to navigate, promising to again stay in populated areas where it's safer. I must admit that he did sneak in one cross-country sprint at the beginning, but after that remained true to his word. The route was a familiar one. Leaving Ra'anana near the park, we headed west across the fields and railway line into Rishpon. From there it was south through Kfar Shmariyahu, and west across Route 2 into Nof Yam. We passed the strangely named Sidney Ali mosque, and continued south through Herzlia Pituach to the beach. We whizzed down the ramp to the promenade (passing Dennis in the wrong direction), through the marina, and along the pier. We stopped at the pier end long enough for Richard to fix my flat tire and Rafi to take more photos (so thank you both), and for all of us to compare missile-spotting experiences. There was some discussion about what to do if a siren caught us off shore, but Rafi explained that crouching under the solid concrete tide breakers along the sides of the pier would be protection enough. Leaving the pier, we retraced our tracks back along the beach and up the ramp (our first time, Dennis's second). Then it was east through Herzlia Pituach and across the pedestrian bridge over Route 2. At the foot of the bridge was an elderly gentleman who stopped, stared, and exclaimed "My goodness, you're all as old as I am!" We continued through the unfamiliar Herzlia Bet neighborhood, past the airport and the IDC College, and onto the Tapuz coffee shop in Herzlia, where four of us stopped for refreshments under the trees. From there it was home. To summarize, Uzi did a great job. It was a beautiful ride of about 32 kilometers with no sirens, and with enough hills to make it pleasantly challenging. There were people out and about by the beach, but less than usual, which meant fewer obstacles. There was also, at some point, a story about a mosque that needed renovating (Sidney Ali? ), but as I missed most of it I'll have to get all the details on the next ride. Due to the situation and the fact the rockets are allowed to fall in open spaces and intercepted only over populated areas, we thought that the smart move would be a nice laid back ride on cycling paths in urban areas. Some preferred a field ride but wisely, I think, were outvoted and our expert guide David led us from Ra'anana through Herzliya, along cycling paths I never knew existed. Full marks to the Herzliya Municipality which has constructed many such paths. We cut through the Herzliya park (there seemed to be no lack of people there) and made our way down to the Herzliya Marina and then back home with a stop at Tapuzim (Herzliya) where Michal had her "compulsory" breakfast described by her as "yummy". Tapuzim, is set in a lovely wooded area, their service, food and location are excellent. If one is out for a Saturday morning breakfast it's a place that I can highly recommend. Anna was the star of the ride, scoring two points... a puncture and a fall!!!! We had nice, easy ride, with great company, lovely small talk and quite a few rude jokes... and oh yes... there were no Red Alerts! We could have ridden in the fields! Participants: A 60/40 split of "Ten Brave Men [and Women] and True" (which included Stuart who, along with his sense of humour, made a welcome re-appearance after some absence) defied the anticipated weather conditions (sharav of up to 36 deg). Route: The Google Earth image faithfully tracks our route from and back to Elishema - a total distance of 36 km, rounded off with a further1 km to the delightful Lula and Kova coffee shop. Bottom Line: There is no such thing as a "Perfect Ride", but sometimes one comes close, and today's ride was one of them (from my perspective, anyway). We started the ride on time (7.02am to be exact), maintained a steady pace throughout, had our quota of calory-killing effort on the Nachshonim uphill, took enough (but not many and not lengthy) "ride-management" stops en route, were back at Elishema by a "sharav-beating" time of 10.15, added to which the variety of the route itself, a sand-free track, and above all else great company. Ira Gershwin's lyrics come to mind: "Who Could Ask For Anything More"!! We covered around 32 km with good company, as always. Shaul, whom we haven't seen in a long time also joined us today and we all wish him a belated 84th BIRTHDAY!!!! I do like to pedal along the Prom, Prom, Prom! My Saturday ritual usually starts off with getting up at 5.30am, having a glass of iced coffee and then getting ready for my weekly bike ride, whether it be an "Away Ride" or a "Home Patch Ride". This Saturday was no different... it was to be another Home patch ride. The important thing about these rides is not so much the locality of the ride, but getting on your bike and cycling with good friends and enjoying the company and the fresh air. 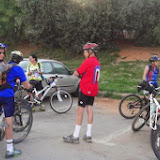 13 of us met at the starting point raring to go but, before we set off we found we had two punctured tyres to repair. This was accomplished in double quick time and off we rode, having decided that today would be a shorter normal ride because of the HOT WEATHER! There were no surprises on the route. David led us along one or two "new" detours. 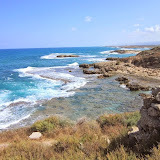 We visited one of the best view sites in the Sharon coastal area ( the photos show it all) and as the weather started heating up, we headed for, what has become one of our favourite breakfast stops, LANDWERS, in the Industrial area of Ra'anana, and then home, another +/-24kms under our belt and no one the worse for wear, despite the weather! Thanks to all of you who braved the heat and made this another happy ride. Participants: Ingride was outnumbered 9 to 1 by the men, so for those mathematically smart among us, we were 10 in all. 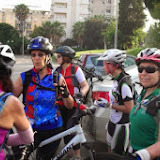 As it subsequently transpired, and by contrast, a (mostly ladies) ride was concurrently also underway for those who opted for the excitement of "home patch" riding from Ra'anana. Route: From Ein Carmel southwards, passing en route the remains of the ancient Roman reservoir which supplied the irrigation needs of the Carmel Plain (thanks Ted for your explanation), continuing on to HaBonim, with a visit to the ruins of the 13th Fortress (thanks Adrian for the historical background), then down to the coast at Nachsholim / Dor, an area steeped in antiquity which includes the site of the ancient Phoenician port of Dor (thanks again Adrian for all the interesting info on this), then back northwards to Ein Carmel, passing on the way the sky diving airfield where we were just in time to see the last few of "a batch" (or is it "a flock") of parachutists descending (thankfully successfully!!) back to terra firma. Total distance 27 km. 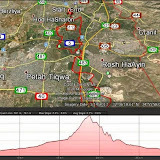 Glitch: On our previous rides in the area our entrance to Kibbutz Nachsholim had been smooth and uneventful. But today was different - today we were confronted by closed gates, an equally "closed" security guard, effectively saying that Nachsholim is closed to the public (legally questionable?). Also, our efforts to change the guard's mind by a phone call to the supposed "person-in-charge" merely reminded us just how unpleasant people can be, given a little so-called "authority"... So we went on our way, made a detour and reached our intended objectives nonetheless. Ironically we could have EXITED from Nachsholim through the very same closed entrance grates just to prove a point! But we had better things to do and other places to ride!! Bottom Line: See the pictures - worth much more than the proverbial thousand words. They tell the whole story, well almost - also great riding weather, great company. A decision has been made that where possible, whenever there is an "Away Ride" arranged, a local ride will also take place for those not able to to the "Away" ride , but who nevertheless want to cycle. 9 of us gathered at the meeting point for what we decided would be a shorter easier ride and which ended up being a more difficult ride and not so short!! I am responsible for the "difficult" part of the ride because of my suggestion to take a different route to Yaqum via Udim. This detour turned out to be more sandy than a "bunker" on a golf course and "walking" was the order of the day!!!! All good things come to an end and happily all bad things do as well, so it wasn't too long before we were back on our saddles again. There were no other "surprises" on the ride. Talia lived up to her reputation near the end of the ride and "got lost" but a friendly biker pointed her in the right direction and we were soon reunited. It was a hot day. There was more than sufficient sand but eventually we made it home to one of our favourite "watering holes", Landwers for breakfast. So, to summerise, a great ride (32 kms +); good weather; great company; a very pleasant "breakfast stop" at the end of the ride with good food and great service. 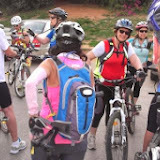 With spring long sprung and summer breathing increasingly hot and humid down the back of our necks, twenty five riders - bright eyed, fluffy tailed and in our prime (like Miss Jean Brodie) - congregated in the traditional hallowed meeting place: the parking lot in Ra'anana. Then after exchanging the mutual morning pleasantries and engaging in light banter, the Cyclenix Flying Phalanx swept out to reconquer the Sharon trails under the watchful eyes of Our Intrepid and Fearless Leader David, our Accomplished Tail End Sweeper Ted and Our Much Honoured Doyen John. The route went to Bazra and onto Bnei Zion. From there we followed Nahal Poleg, climbing north to Tel Yitschak and Massua. We then wound our way to Udim, descended a steep path to stop in a pleasant glade for reassembly and a bit of a breather. Our next destination was the service station and café at Kibbutz Yakum - the traditional Saturday meeting place, amongst others, for very well off gentlemen to assemble and show off their expensive cars. Naturally, we Cyclenixes look down our noses at such conspicuous consumption and show of wealth! We most certainly don't agree with the saying: "It's easier to cry in a Ferrari than on a bicycle." Saturday's ride was the customary mix of traversing gravel paths, winding through orchards, climbing a few uphill gradients with their following welcome downhill sweep and of course, meeting the occasional bane of all us all - having to dismount and trudge through thick sand. At one stage, we came to a short, very steep hill where most of us decided that discretion was the better part of valour, accordingly dismounted and pushed our steeds up the slope. Not for Michal! Undaunted, she decided for the sake of the show to give it a go while we chicken hearts watched in silent admiration. She gave a long run and almost made it to the top and for that she deserves a special honourable mention! After lengthy deliberations at Yakum, it was decided to return to Ra'anana to end the morning with coffee and refreshments at the café adjacent to the park lake. As it was getting warm and the clock was close to eleven, the café was indeed a welcome and well eared oasis after a pleasant ride. Thus ended a typical Cyclenix Saturday ride: savouring the simple pleasure of getting on a bike, leaving the city behind and enjoying the sensation of riding in the countryside in the good company of like-minded and pleasant people. Once more, a thank you to David for leading us and to Ted for being at the tail end and ensuring that everyone arrived safely. Participants: We started with 23 and ended with 17. 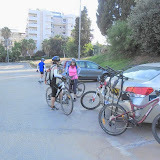 Nothing sinister, just six riders who split off at the start to go on a shorter ride; two riders who left us in Ramat Ha'Hayal to return home via Hod Hasharon; and two more riders who decided to lengthen their ride in preparation for a cycling trip overseas. Route: (Courtesy of Michal and David) We left Ra'anana and rode south through the fields around Givat Chen and Hod Hasharon, crossing Route 4. We joined the Yarkon River, continuing southwest along its banks (crossing Routes 5 and 4 again respectively) until we reached the Ramat Ha'Hayal neighborhood of Tel Aviv. From there we turned north past Kiryat Atidim and Nive Sharet, and headed back into the fields. 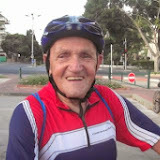 We crossed Route 5 for the second time and rode into Ramat Hasharon, where we stopped for breakfast and a chat at the Assaf Artisanal coffee shop. From Ramat Hasharon we continued north to Herzliya and east back to Ra'anana. Miscellaneous: 1. We encountered a lot of sand at the beginning of the ride, but luckily it stayed where we left it. 2) The banks of the Yarkon river were extremely bumpy, especially for those without back and/or front suspension. 3) Michal was wearing a snazzy new riding outfit. 4) We crossed the highways either over bridges or under tunnels, not fleeing across six lanes hanging onto our helmets for dear life. 6) Rafi and Haim were both back from vacations that sounded lovely. 7) John and Michal discovered with glee that removing letters 4-7 of the coffee shop name produces two indecent anatomy-related words. 8) I learned that a tip cannot be "nice", but it can be "generous". 9) Everyone got what they ordered and on time, so the Assaf Artisanal coffee shop has not yet been blacklisted. Summary: It was another great ride under our belts, with perfect weather conditions, good company, and just enough comings and goings to polish our counting skills. Congratulations John - till 120!